My father just taught me a technique to avoid overcooking broccoli. When it is finished steaming and is just the right firmness, he said, leave it in the steamer basket and drizzle a little bit of cold tap water over it. The cold water will stop the cooking process so that the broccoli won't get any softer. This is similar to the concept of blanching but without full submersion which would likely make the broccoli too water-logged. 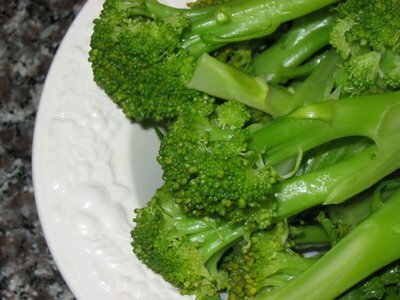 I love broccoli, it's been my favorite food since I was a child and I used to call them "trees." I've never met a broccoli dish I didn't like. My preference is plain, undoctored broccoli - No butter, no salt, no nothin'. I recently discovered the joy of buying dried chickpeas and cooking them myself instead of buying them canned. I started buying dry beans instead of canned to save some money, but now I'm starting to appreciate the difference in flavor and texture. This photograph shows the beans soaking in my favorite Pyrex bowl. 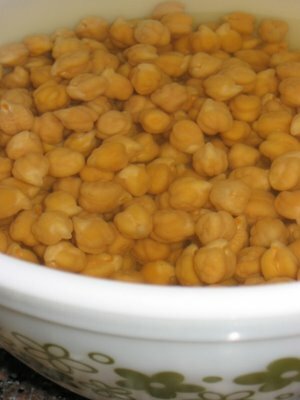 Chickpeas, also known as garbanzo beans, are one of the many ways I sneak more calcium, protein and fiber into my diet. I toss them on salads. I throw them in pasta with tomato sauce. I make Indian curries with them. 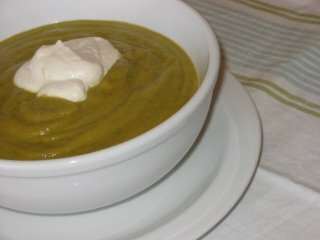 I puree them into creamy hummus that I eat on raw carrots, celery and red bell pepper, or on rice crackers. I love their nutty, unique but unimposing flavor, and their soft texture. Here are instructions for preparing dried chickpeas, and then a recipe for my hands-down favorite chickpea dish, which I'll be having for lunch today with domas (Greek rice-stuffed grape leaves) and a broccoli and feta salad. Place dried chickpeas in a bowl or pot and add cold water to cover by 3 inches or more. Leave them at room temperature for 4 hours, or overnight. Rinse, drain and place in pot. 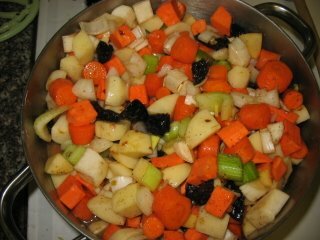 Cover by 4 inches or more with cold water or vegetable stock. For every 2 cups of dried beans, add 1 teaspoon of salt. Optionally, you can add bay leaves, onions or garlic at this point to impart extra flavor. Bring to a boil over high heat. Cover partially (leave just a little gap so that some steam can release) and reduce to a simmer. Check the liquid periodically and add more when necessary to ensure that beans are always covered. Cook over low heat for 1 1/2 hours or until the beans are soft but not mushy and still retain their shape. Combine tahini, olive oil and garlic in food processor or blender. Blend until pureed. Add remaining ingredients, blend until smooth and creamy consistency. 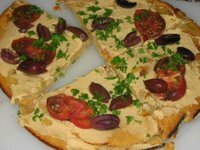 Serve at room temperature, with pita bread, on crackers, as a sandwich spread, or as a dip for raw vegetables. Store in refrigerator. It will keep for up to 2 weeks. I tossed a few marinated artichoke hearts in when I took seconds. 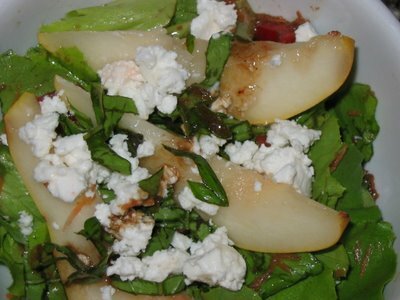 This salad works with any goat cheese, but the saltiness of a goatsmilk feta really complements the sweetness of the pears particularly well. Mmmm...muffins! This is a photograph of my attempt at Brendon's Raspberry Double-Coconut Muffins. A friend requested my potato kugel recipe. For those who don't know, kugel is a baked Jewish casserole with many variations. The recipe I use is this one. Use a lasagna pan and it will turn out just thick enough to be creamy on the inside while the outside becomes brown and crispy. It has a nice zing to it when you add fresh ground pepper, and it freezes well. It's meant to be a side dish for dinner, but it makes a perfect breakfast food, too. When Manischewitz starts making its kosher-for-passover potato-based egg noodles (only available near Passover time) I will stock up on them and work on a gluten-free noodle kugel recipe... Which is one of the foods I'm missing the most. 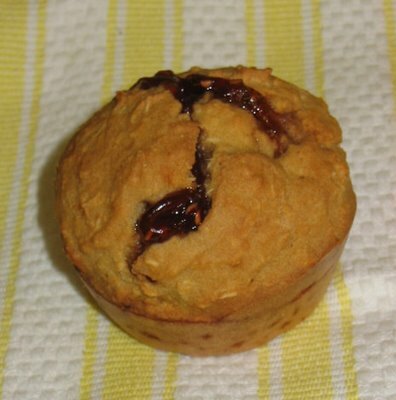 This was my first time using coconut flour, and the result was a rich, sweet muffin that is completely grain-free as well as dairy-free and, obviously, gluten-free. They are quick to make and stay remarkably moist even when stored for a few days. Coconut flour absorbs a huge amount of liquid, so very little flour is necessary. The eggs act as a binder and leavening agent and the muffins need very little honey in order to be quite sweet. 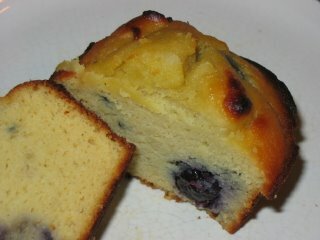 I used the coconut flour from Bob's Red Mill, which I found at Piedmont Grocery. These are definitely muffins for coconut lovers only! Whisk eggs, butter, coconut milk, honey, salt and vanilla until thoroughly blended. Sift all coconut flour (1/4 cup plus 2 tablespoons). Stir sifted coconut flour and baking powder into the batter and stir until there are no lumps. Fold in frozen blueberries, stirring gently. Pour batter into greased muffin tin. Bake at 400 F for 15-18 minutes. Makes 6 muffins. Someone on the Bay Area celiac disease e-mail list is putting together a casual meetup for gluten-free and celiac folks. A group of people will be going out to eat together at Pizza Rustica in Oakland, where they are now serving gluten-free pizzas, on November 15th, 2006. 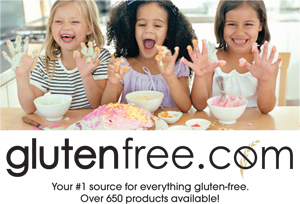 For details, go to http://celiacdisease.meetup.com/93/ - Be sure to register and RSVP on the site. Tonight's dinner was a successful revision of kasha varnishkes, served up gluten-free. I grew up eating this Ashkenazi Jewish dish, a combination of nutty kasha, sweet browned onions, and toothsome noodles. It is great as a side dish with meat, but I enjoyed it this evening as an entree, with just a green salad on the side. This dish is traditionally made with bowtie noodles. Sadly, in my extensive internet research I discovered that there doesn't appear to be a gluten-free bowtie noodle on the market. I was glad to discover that Glutano Gluten-Free Pasta Tagliatelle* which is made of maize, is a great substitute. It has the right texture and taste for this dish. If you can't find tagliatelle, try any other flat, gluten-free noodle. Egg noodles are preferable - Break them to the length of bowtie noodles if they're longer. Mmm... nothing like some carb-on-carb action! 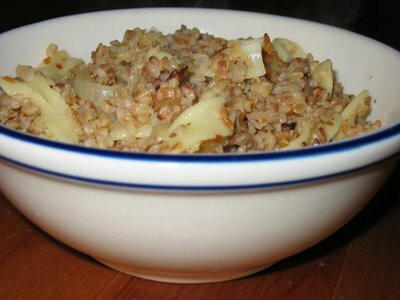 Kasha, for anyone who's confused, is another name for buckwheat groats. Buckwheat is a misnomer, as it is not related to wheat in any way and is safe for people with celiac disease. Beat the egg in a small bowl. Add kasha and stir until every grain is well coated with egg. Place in a medium saucepan over medium heat and stir constantly with a wooden spoon until the egg begins to dry and the groats separate. Some of the groats may stick together and/or brown slightly. Pour boiling chicken stock over the kasha. Mix in salt and pepper and stir thoroughly. Cover and cook over low heat for 10 to 15 minutes or until the kasha has absorbed all liquid. Remove from heat. In a separate pot, bring water to a boil and cook the pasta until done. Drain and set aside. In a skillet, heat the oil (or schmaltz) on a medium flame. Saute the chopped onions until thoroughly browned. Add the onions and noodles to the pot of kasha, and adjust salt and pepper to taste. *Edited 3/09 to add: Glutano Tagliatelle doesn't have kosher certification. I now use Manischewitz Passover Egg Noodles which I stock up on at Passover when they're in the stores, or I cut Tinkyada Lasagna Noodles into strips. One of my favorite Bay Area bloggers, who also happens to be a friend, is Poet With a Day Job. Check out her writing, it's smart and funny. She shares well-crafted words about the corporatization of food and drink in Starbucks Is the New McDonalds. If you are like me, you will immediately want to go to Starbucks afterwards, and then will sit at your desk drinking your mudwater coffee with the essence of cardboard, wondering why you did that. You may be someone who avoids buying food products that have biblical quotations on the packaging. Or, like me, you may find said food products particularly intriguing. Either way, Food for Life not only has an adorably animated website... They also make Black China Rice Bread, which is made of whole grains and sweetened only with a little bit of fruit juice. No gluten, no dairy. It is a deep, blackish brown color like pumpernickel bread and is tastier than the other Food for Life breads I've tried - Richer and sweeter, and would taste great alone with a little butter though I've been eating it for breakfast with almond butter and raspberry jam. Lesson from last night's dinner: If you're making a green curry, and the vegetables end up exceedingly mushy from being overcooked... Throw the whole thing in the blender and make it into a creamy soup, and no one will ever know. GlutenFreeGirl's flourless peanut butter cookies are tasty even when made with the wrong kind of sugar AND the wrong kind of peanut butter. 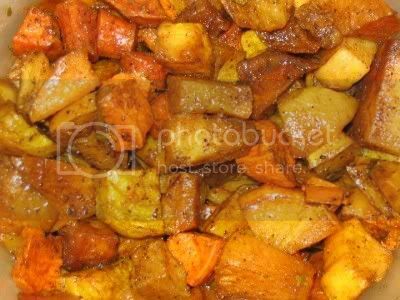 This is an easy side dish using ingredients that are bountiful in fall and winter but available all year round in most regions of the U.S. Of all the recipes I've posted on RecipeZaar, this is the one that's been bookmarked the most. It features one of my favorite flavor combinations: Roast garlic, fresh rosemary and honey. All measurements are approximate and substitutions can easily be made. 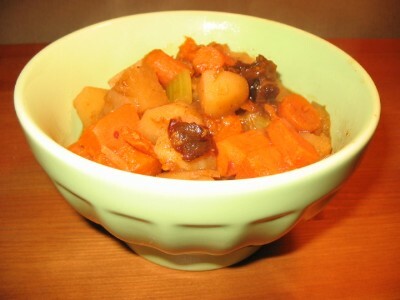 Try switching out different root vegetables, using whatever you have in your fridge or can find at the farmer's market - I once successfully made this dish with just white potatoes and carrots. No obsessive measuring is necessary, which is great for us lazy cooks. I usually serve this dish hot but is also very tasty at room temperature, either solo or mixed in with spring greens and a balsamic vinaigrette or gluten-free "goddess" (tahini and lemon based) dressing. Cut the bottom 1/4 inch of each garlic clove off but do not peel cloves. Toss ingredients in a large, deep baking dish or roasting pan. Roast, uncovered, for approximately 30 minutes or until all vegetables are soft throughout. Toss vegetables and turn heat up to 400 F degrees. Roast until vegetables are browned and caramelized (15-20 minutes). Serve hot or at room temperature. Makes about 8 servings. I am such a blog-slacker! Brendon of Something In Season tagged me in this post for last week's meme. I was to answer the question "What menu would you serve blogging friends for a welcome dinner upon their first dinner to your home?" I've been pondering this for the last week, and I had a hard time with this one so I've thrown together what looks like a good meal consisting of what I consider some of my better dishes. I am a fairly simple cook, despite having worked for chefs who were French-trained, I have a tendency toward one-pot meals and wholesome ingredients. I rarely make a meal that is more than two courses, even when I'm cooking to impress. The courses of this imaginary meal are all gluten-free, of course, but are also very much in keeping with my denial about the fact that I should not be eating dairy. 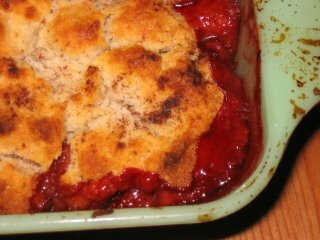 I made my first attempt at a gluten-free cobbler. The biscuit topping was not as perfect as I was hoping for, but it was satisfyingly biscuit-y. The fruit beneath it was nothing but delicious, with the distinctive taste of pear peeking through the tart sweetness of strawberries. It's a perfect fruit combination for this transitional season, when here in Northern California there are still juicy strawberries on sale at the farmers' market and pears and apples are fully in season. On a fatty note, I recommend using Spectrum's palm oil based shortening, as it's non-hydrogenated and has none of those much-maligned trans fats. Serve this cobbler alone or with whipped cream or vanilla ice cream. And don't forget to give me your feedback, as this is the first cobbler I've ever made and definitely a work-in-progress. Preheat oven to 375 F. In a medium bowl mix the sugar, cornstarch and nutmeg. Add berries and pears, and mix thoroughly until fruit is coated with the dry ingredients. Pour fruit mixture into greased 8x8" baking dish. In a large bowl, mix baking mix and salt. Cut shortening or butter into the baking mix, using your hands to mix until no large lumps appear. Add milk or milk substitute, and mix thoroughly with a wooden spoon (the mixture will not be completely smooth). Spoon batter over the top of the fruit, spreading over the whole dish. It will be thick, so use your hands to distribute it evenly. Leave a few small uncovered areas so that some of the liquid from the fruit can evaporate during the baking process. (Optional: Put a few pats of butter on the top of the cobbler before putting in the oven.) Shake a bit of cinnamon evenly over the top of the dough. Bake for 30 minutes or until knife inserted in biscuit topping comes out clean and the top has browned. Serve warm.
. I no longer use Pamela's products in my house since I now have a more strictly kosher kitchen. If in doubt, check with your rabbi! Yesterday I ventured over to Cafe Gratitude, for a mid-afternoon slice of "cheesecake." For those not in the know, Cafe Gratitude is the Bay Area's own raw, vegan, 90% gluten-free* restaurant. The cheesecake was pretty tasty, as always... Creamy if not flavorful. The pumpkin pie my companion ordered was excellent. The highlight of the meal was the ginger-beet-kale (etc, etc) juice which delicately combined a number of flavors into a refreshing and tangy beverage. I could have gulped down a gallon, but at $4 for a small glass I made my 6 ounces last as long as possible. I stuck to my promise to only eat desserts and juices at Cafe Gratitude, since my experience of their savory foods was that they are like Drano to my sensitive digestive tract, and a little too mucilaginous for my tastes (must be all the flax seeds). While there, I purchased a chocolate bar from the Cafe's gift shop area. The "xocolatl" bar from Dagoba is a dark, gluten-free organic chocolate with cocoa nibs and chilies. You can read a review of it here from someone who is more of a chocolate conoisseur than myself, but suffice it to say it is quite a lovely experience, balancing smooth and crunchy textures, and sweet and spicy flavors I'm finishing it off today at work, and it's inspiring me to look up recipes for chicken mole, my favorite combination of chocolate and hot peppers. Chocolate has far more satisfying applications than mass-marketed candy bars, friends. *Though the staff is sometimes misinformed about this, the restaurant uses gluten-containing soy sauce in some of their dishes... So be sure to ask the ingredients of anything you order if you are gluten sensitive! When Brendon of Something In Season posted lovely photos of a new meal creation on Friday, I knew that's what I'd have to have for dinner. Quick and nutrient-rich, and nicknamed "Eggs Davis", this dish as I made it straddles the line between frittata and casserole. I tweaked Brendon's recipe, using kale instead of chard, and beaten eggs instead of individual eggs. 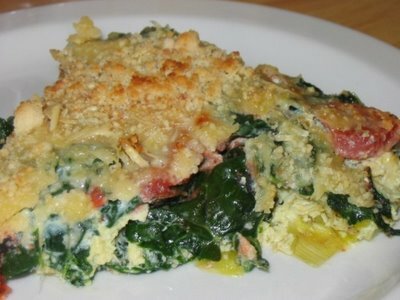 The result is a casserole with a bottom layer of leeks, followed by a thick layer of greens, and then layers of tomato, egg, and cheese, topped with the toasty breadcrumb-like crunch of finely ground almond flour. It holds together well enough to serve in neat, pie-shaped slices and reheats well in a toaster oven set to 350 degrees. Preheat the oven to 375. Add oil to a cast iron pan. Heat oil on medium heat. Add leeks and sautee until the leeks begin to brown. Spread leeks evenly around the bottom of the pan and remove from heat. Bring 1-2 quarts of water to a rolling boil, then add a tablespoon of sea salt. Wash and remove stems from kale, and chop roughly. Submerge chard in boiling water for 1-2 minutes or until tender. Drain completely in colander. In a bowl, beat 4 eggs thoroughly. Line cast iron pan with an even layer of kale. Sprinkle chopped tomatoes on top. Add a generous amount of ground black pepper. Then pour beaten eggs over the vegetables (use a spoon to make sure the egg mixture spreads all the way to the outer edge of the pan). 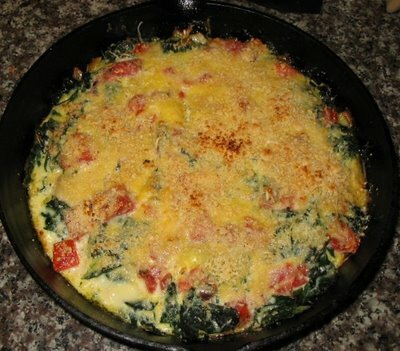 Spread grated cheese evenly over the eggs, and then top with almond meal. Bake for 15-18 minutes or until eggs are firmly set. Place under the broiler for 1 minute or until the almond meal begins to brown in spots. Slice and serve. Makes 4-6 servings. So, there's this fabulous place called Grocery Outlet, known fondly as GroceOut by its loyal patrons. It's a deep-discount bargain grocery store with locations in CA, AZ, OR, NV, WA and ID. It's full of close-outs, food with wierd packaging errors, items that were intended for shipment to another country and thus aren't packaged with English writing, and day-old bread from upscale local bakeries. Lots of packaged food that only has a month or so until its expiration date, and thus won't sell at a regular grocery store, where people expect their packaged goods to be good for another year. And then there are totally normal looking foods with recognizeable brands that are at Grocery Outlet for some perplexing reason we will never know. And oh yes, there are treasures. Treasures, I tell you. Really amazing finds at rock-bottom prices. I went there all the time when I was really broke. Aseptic packages of Imagine's Creamy Butternut Squash soup, which is one of my favorite prepared soups and the foundation of many soups and other dishes I make... for 50 cents each! Mrs. Leeper's gluten-free meals-in-a-box (a GF version of "Hamburger Helper", etc) for under a dollar. I won't eat these, but I know this find will make someone's day. I've heard rumors they sometimes have Amy's frozen food there, too. I sadly did not have time to wait on line, so I bought nothing. I will have to go back this weekend. I figured that now that I eat no gluten and almost no processed food I wouldn't find anything useful at a store that's built its reputation around frozen mini pizza-burritos and close-to-expiration Lunchables, but I was wrong. Mix all ingredients together until batter has a smooth consistency with no lumps. Batter should not be too thin or too thick. Pour 1/4 cup batter at a time onto a pre-heated (medium heat), lightly oiled griddle or pan. Cook until golden brown, flipping once. Serve immediately. Yields six 4 inch pancakes. Extra pancakes can be frozen or refrigerated, and reheated on a griddle, in the oven, or in a toaster oven. 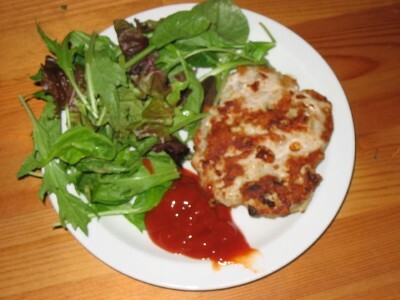 This turkey burger recipe also works well with beef, though cooking times may be slightly different. I find these burgers flavorful enough to eat without a bun and without condiments, I'll simply pair them with a vegetable dish and some rice or potatoes. Broiling is a nice, quick alternative to grilling for apartment dwellers, cold or rainy days, and lazy people such as myself. Mix ingredients thoroughly with hands. Shape into 4-5 patties, 3/4"
side (burgers should brown slightly). 10/11/06 - Mayo Clinic researchers have uncovered a new link between celiac disease, a digestive condition triggered by consumption of gluten, and dementia or other forms of cognitive decline. The investigators' case series analysis -- an examination of medical histories of a group of patients with a common problem -- of 13 patients will be published in the October issue of Archives of Neurology. Click here to read more. Tzimmes is like chow mein or stew---almost anything goes. Try sauteing an onion and the adding sweet potatoes, carrots, prunes (if you want), orange juice, cinnamon, an apple or two (if you want), and a bit of brown sugar or maple syrup (if you want) and bake covered at 350 for an hour covered tightly OR cook on low heat on the stove for about the same time (stir occasionally so it doesn't burn. How's that, bubbelah? I wanted to combine his suggestions with some other recipes, so I cracked open my trusty Jewish cooking bible, Mama Leah's Jewish Kitchen. Mama Leah is a close friend of my family and is truly the Queen of Blintzes. I used her pareve Tzimmes recipe as the basis for my project this evening. The result was sweet and peppery, and tasted much like I remembered from my childhood. The only thing missing was the brisket! Place all ingredients in a pot. Cover and bring to a boil. Reduce heat to low and simmer for about 1 hour. Stir frequently. Cook until carrots are soft but not mushy. Tzimmes should have the consistency of a thick stew with very little liquid left in the pot. Serve hot. NOTE (9/10/07): See updated pareve (dairy-free) update of this recipe with photographs here. Please note that Pamela's baking mixes are under kosher supervision but are not certified by a mainstream kosher certifying agency, so most people who keep strictly kosher kitchens will want to use another gluten-free baking mix. I no longer use Pamela's products in my house since I now have a more strictly kosher kitchen. If in doubt, check with your rabbi! 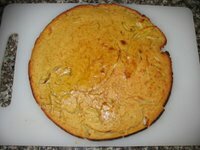 I couldn't find a gluten-free honey cake recipe, so I created one myself. And I'm posting it here so I can be sure to find it next year when Rosh Hashanah rolls around. Wish I'd taken pictures of it before I gobbled it up. You can also find it on RecipeZaar here. This is a rich, moist gluten-free honey cake infused with the essence of orange. This recipe uses Pamela's Ultimate Baking & Pancake Mix, a widely available kosher gluten-free mix that contains no added sugar. It's available at Whole Foods, and in the East Bay I've found it at Berkeley Bowl and Piedmont Grocery... You can also buy it more cheaply (and in larger quantities) here . If you use a different GF flour mix, you will need to add additional baking powder and xanthan gum. For this recipe, a 9" round cake pan is ideal but a 9x13" square pan can be used if necessary. 2. Cover the bottom of a 9" circular baking pan with parchment paper, then spray the inside of the pan lightly with baking spray. 3. Stir together the flour mix, baking powder, baking soda, nutmeg, cinnamon and salt. Set aside. 4. Separate the eggs. In one bowl, beat the egg whites until they form stiff peaks. In another bowl, combine egg yolks, sugar, honey, oil, applesauce and orange zest. 5. Using a whisk or hand beater, add the flour mixture and orange juice to the wet mixture slowly. When mixed thoroughly, fold the egg whites carefully into the batter, stirring just until ingredients are fully combined. 6. Pour batter into pan, and bake in the preheated oven for 45-50 minutes or until a toothpick inserted into the cake's center comes out with just a few crumbs on it. Remove from oven and allow to cool before carefully removing from pan and placing onto a cooling rack. These are the two Jewish dishes I miss the most, so today I'm making a public commitment to create at least a Version 1 Beta of each by the end of the month. You have my permission to scold me if I do not accomplish these projects by month's end. Oh, the joy of the socca! Much as I love coming up with creative gluten-free substitutions for gluten-containing foods... There's always a certain pleasure discovering foods that were meant to be gluten-free, that were originally designed around non-gluten ingredients. Such is the case of the socca, a savory pizza-like flatbread from Southeastern France. 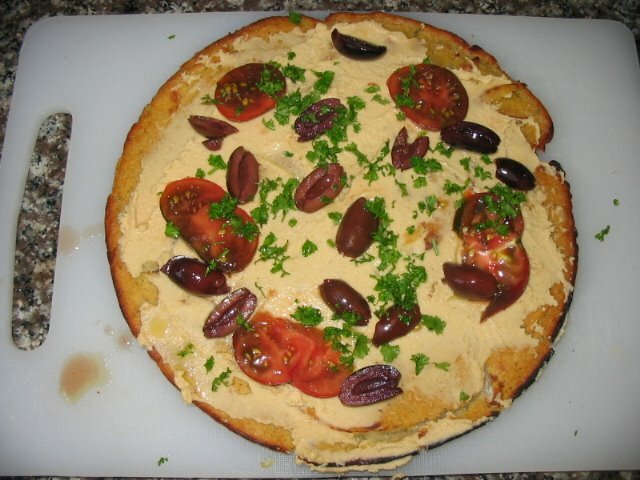 This Provencal pancake is made from garbanzo bean flour and is so easy to make. It can be eaten alone or topped with any number of ingredients. Serve soccas with any kind of savory topping you like - Try them with tapenade, ratatouille, or sauteed vegetables and herbs. A plain socca = a blank palette! I couldn't wait to eat it up so I cut it in quarters with a pizza cutter. 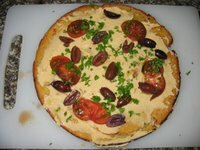 As you can see I topped this baby with home-made hummus, kalamata olives and heirloom tomatoes and parsley from my garden. Eventually I hope to attempt to try variations with fish and tapenade. A sauteed vegetable topping is also in order. Try this recipe with similar toppings, and then riff of it to create your own variations. Adapted from a recipe by Mark Bittman of the New York Times. Place heavy (preferably cast-iron) skillet in oven and preheat to 450 F.
In a large bowl, sift chickpea flour, pepper and salt together. After sifting, add rosemary leaves if desired. Whisk in warm water and 2 tbsp olive oil. Cover the bowl and allow the batter set for at least 30 minutes, add sliced onion to the batter, which should have the consistency of thick cream. Remove skillet from oven. Add 1/2 tbsp olive oil to the hot pan, pour batter into pan and bake for 12-15 minutes or until the pancake is firm and the edges are set. Set socca a few inches below your broiler for a few minutes, just long enough to brown it in spots. Cut into wedges and serve hot, with toppings of your choice. 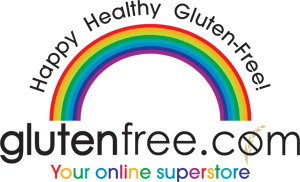 Welcome to the future home of Gluten-Free Bay... A kosher gluten-free food blog. Stay tuned for recipes, restaurant reviews, gluten free product reviews, tips, rants, and resources.